Scientists from FOM Institute AMOLF have made the protons in water a bit less mobile. They did that by adding positively charged ions to the water. Protons dissolve in water in an unusual manner. A proton binds to an oxygen atom of a water molecule followed by a spreading of its positive charge over the hydrogen atoms of several nearby water molecules. The proton can move very efficiently through water by transferring the positive charge to the hydrogen atoms of other water molecules. As a result of this special mechanism protons are highly mobile. This high mobility plays an important role in living organisms. The distribution of the positive charge across several water molecules has a major effect on the structure of the associated hydrogen bonds. The hydrogen bonds of molecules that accept some of the positive charge are stronger than 'normal' hydrogen bonds. They also re-orientate or rotate less quickly: the water molecules are locked by the proton. A single proton can immobilise as many as 19 water molecules. 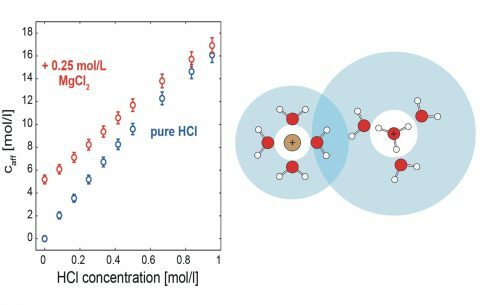 Recently scientists from FOM Institute AMOLF investigated with dielectric relaxation spectroscopy whether the stiffened hydrogen bonds can be weakened by adding ions. What was the result? When the researchers added magnesium ions to the water, for example, the protons could not maintain their grip on the water molecules as easily. The effect of the protons decreased by 20% if 0.25 M Mg2+ was added. Calcium ions were observed to yield a similar result. The researchers propose that calcium ions and magnesium ions ensure that the positive charge of the proton spreads over fewer water molecules by means of Coulomb repulsion. Consequently less water molecules are held stationary and fewer water molecules rotate slowly. Left panel: concentration of slowed down water molecules as a function of the acid concentration (HCl). Addition of 0.25 M MgCl2 resulted in a far less rapid increase (less steep curve) of the concentration of slowed down water with the acid concentration. Right panel: schematic representation of the effect of a positive charged ion such as calcium or magnesium (light brown) on the delocalised positive charge of a proton in water.